Hamlet: "I'll make a ghost of him that lets me!" Shakespeare wrote some pretty scary stuff. 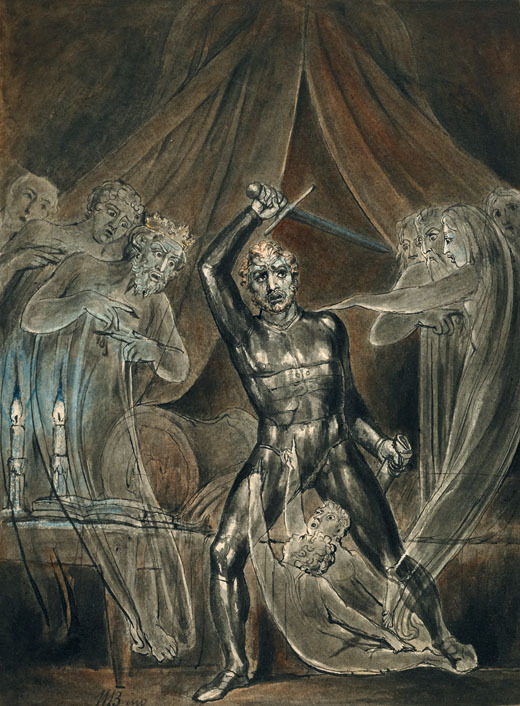 Besides the chilling Witches in Macbeth, he wrote in several roles for ghosts. 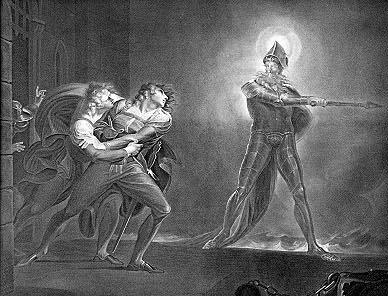 We’re familiar with the Ghost of Hamlet’s father, which appears and re-appears to spur Hamlet onto revenge (and may have been played by Shakespeare himself when the play was produced by his company). 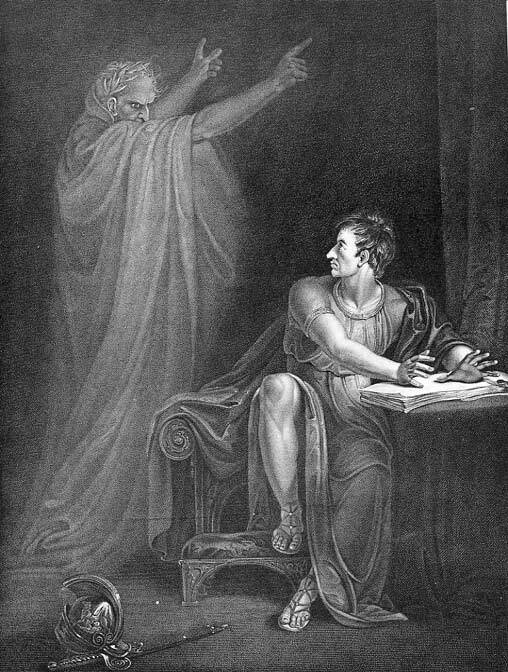 There is also the ghost of Julius Caeasar, which returns to haunt Brutus on the eve of battle at Phillipi, portending that Brutus will not survive (IV.iii). Similarly, Richard III is haunted by the ghosts of those he has had killed for his crown, and they tell him to “despair and die” while encouraging Richmond to “live and flourish” (V.iii). Ghost of Caesar: "thou shalt see me at Philippi"
It is interesting to note that most or all of these invocations and visitations take place on the eve of battle. ghosts appear to prepare (or shake) the battle’s leader. If the ghosts are a figment of an unstable mind, what does that say about the characters they appear to? If they are demons or angels or miracles, how does that change the way the story is interpreted? If that’s not enough Halloween for you, try on these Shakespearean Costume ideas from Shakespeare Geek. 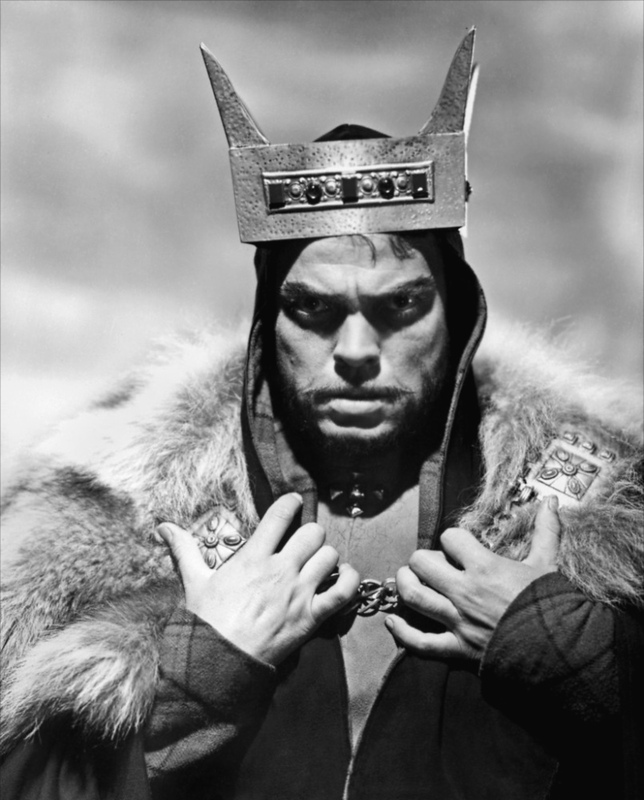 Orson Welles had a love affair with Macbeth. Many teachers know him from the 1948 feature film which he both directed and played the title role. Sure it’s in black & white, and yes he rearranges scenes, seems to make up bits of dialogue , and even leaves the witches out of act 4, scene 1 (we only hear their voices), but the film has enough originality to make it still work today. If you want to read more about this production, I’d suggest two books. 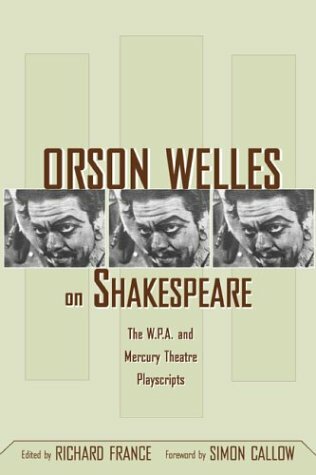 The first is simply called Orson Welles on Shakespeare edited by Richard France. In addition to an excellent foreword by Simon Callow, it includes the entire script that Welles used. 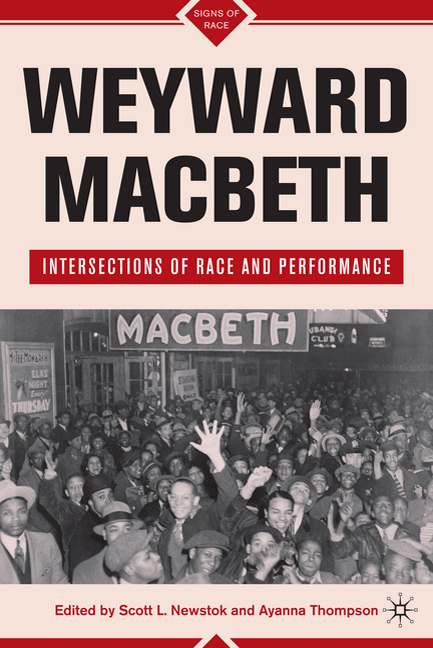 Weyward Macbeth:Intersections of Race and Performance is a more recent book that touches on that production in some depth. The collection of excellent essays was edited by Scott Newstok and Ayanna Thompson who devote an entire section of the book to this fascinating episode in the American theater. So I wonder: does anyone still use the 1948 Macbeth film when teaching the play? And does anyone discuss the Voodoo Macbeth with students? I’d love to hear from you if you do. 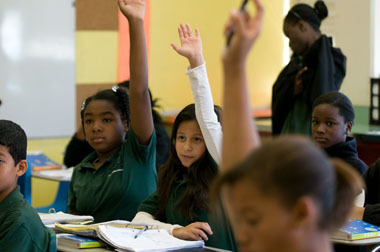 Students in our High School Fellowship program are studying Henry VIII, Pericles, and Richard III this year. One of my colleagues in the Education Division described the plays to potential students in the program as being among Shakespeare’s “lesser known gems.” Richard III is most likely better known and more often staged than either Pericles or Henry VIII, so the designation probably holds true for two of the three. All of the plays have something to recommend them for study. So, why don’t we teach these “lesser known gems” more often? One of the most important lessons I took away from the Teaching Shakespeare Mini-Institute in Decatur in June 2008 was a quick assessment Mike LoMonico modeled called “I Noticed.” We sat in a big circle after an activity or at the end of the day, and we each finished the sentence that began with “I noticed…” It was an opportunity for us to talk about what we had learned, anything we had learned. It could be a simple check in about how we were feeling, or it could be some profound connection we had made. Either way, Mike and the other instructors accepted all of our responses. At the end of class one day the following school year, I decided to try out “I Noticed” with my own students. We had about five minutes at the end of the period. My British Literature and Composition students had a really good class in which everyone was on his or her feet acting at some point. We had reviewed subtext and tried some exercises before getting in groups and using subtext and movement to interpret lines from A Midsummer Night’s Dream. I started with “I noticed how much fun it was when everyone participated and got involved today.” My entire insides screamed YES! when one student said, “I noticed how reading the text and trying different subtexts and acting made it easier to understand the play.” It was the best five minutes of my teaching all week. Since that class, I occasionally use “I Noticed” as an assessment, and not just when I teach Shakespeare. Everyone must participate, even quiet students, and I often have valuable feedback on my teaching and on students’ learning. One day last year when studying Macbeth, the quietest, most reluctant student in my class said “I noticed how it is easier to understand Shakespeare when you have to act out the scenes because you think about what they mean.” I noticed that, too. Dana Huff is a Teaching Shakespeare Mini-Institute 2008 alumn, and a full time English and Writing teacher at Weber School in Atlanta, GA. She will be presenting on Assessment at this year’s National Conference for Teachers of English in Orlando, FL with Folger Education Staffmember Carol Kelly. Having a sneak peek behind the scenes of a theatrical production is always exciting. 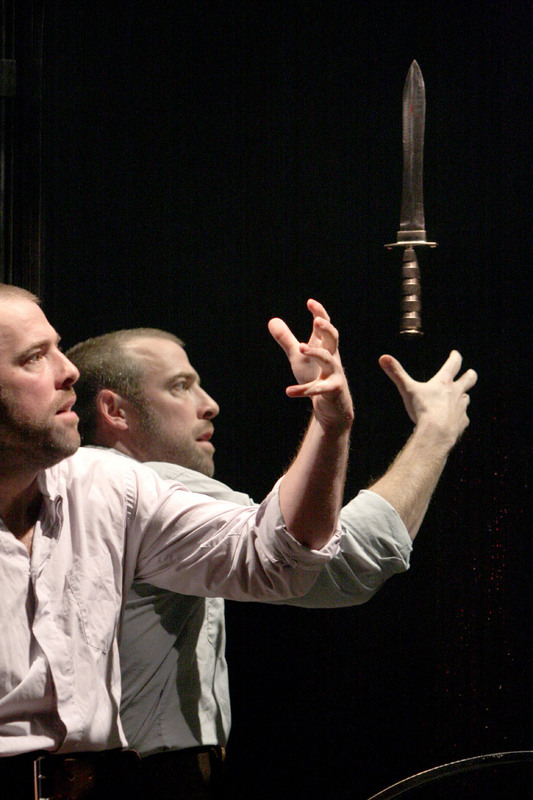 The special features on the DVD of the 2008 Folger/Two River production of Macbeth – designed especially with students and teachers in mind – reveal some of the thought processes and deliberations that went on before rehearsals began. Some features also show how much this production was a collaborative effort on the part of actors, designers, directors, fight choreographers among others. Sharing some of this documentary with your students can be a very rewarding experience as it offers opportunities for them to explore issues through the filter of a medium (movies) in which they feel comfortable. What does it take to engage an audience? Do directors consciously focus on a particular niche market or appeal to a specific age range or social group? What techniques can they adopt to widen the accessibility of a play, particularly one by Shakespeare? The “Directing Macbeth” special feature is an excellent tie-in for this, and is available for viewing here. The other lesson explores Shakespeare’s use of repeated words. Again, supported by discussions on the DVD, students are encouraged to identify literary devices such as word repetition, dual/multiple meanings, connotative associations that emerge from the text and interpret them as an early form of “special effect”. Shakespeare knew what he was doing and without all the technology available today, was able to create atmosphere, weave intricate patterns into the story line and foreshadow events through skilful use of language. Take a look behind the scenes with your students- you never know what you will find! The DVD is available with or without the Folger edition of Macbeth from the Folger Gift Shop. In the age of more and more Tinkerbell movies(yes there’s another one coming soon), one can understand an elementary educator’s propensity towards producing A Midsummer Night’s Dream with their students. Young girls can be quite drawn to the idea of putting on those fairy wings and singing a sweet lullaby to their Queen. Budding young actors love the idea of strutting their stuff as mechanicals preparing a play within the play. And with the hijinx that ensue between Oberon, Puck and the lovers, there is no end to the potential for side-splitting laughs with the children. Also, from a teacher’s standpoint the language is likely far clearer and easier to teach than other Shakespeare works. However. 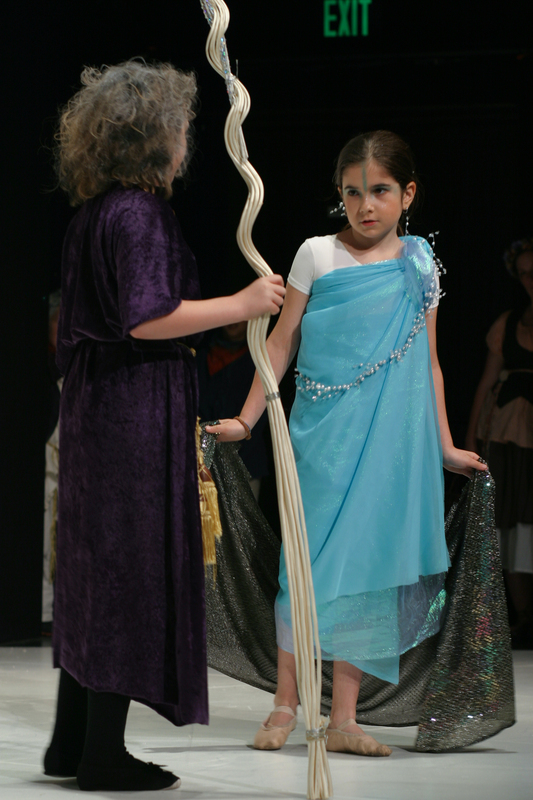 Midsummer is not the only play that can be made suitable for performance by elementary students! I suggest that young troupes may dare to take on plays with other thematic elements that might be appealing to elementary children. Why not tap into the Harry Potter streak and throw a little Tempest into the mix? Plenty of potential for casting would be wizards, sprites and strange creatures there. What about the longing for power and glory and the sheer menace in Macbeth or Richard III? Betrayal, treachery, really cool sword fights, hello? Kids can shock you with their ability to handle the complexities of Hamlet. Don’t want to go to that dark place with your students? The antics in Twelfth Night, As You Like It or Comedy of Errors can also be a pleasant departure from the norm. Mistaken identity and genderbending are always a hit! What do you think? Should we challenge ourselves before we send another fairy traipsing across the stage? Or when working with young students is it best to go with a play somewhat less challenging, more familiar and that has more party store accessible costuming choices?